My father was an oil man. Not a rich tycoon like JR Ewing - as he always puts it, he was 'at the bottom of the barrel', in bitumen. So I've grown up knowing that the oil industry is a dangerous place, where, despite the imposition of late 20th century health and safety rules, nasty accidents can happen. But the dangers of exploding gushers, raging fires and rogue machinery are as nothing compared to the dangers of crossing There Will Be Blood's turn of the century antihero Daniel Plainview. Played by a more than deservedly Oscar winning Daniel Day-Lewis, oil prospector Plainview has dragged himself out of a hole in the ground to become a millionaire. Together with his small adopted son HW, he has made a career of buying up cheap land from gullible hick townspeople and draining it dry of its oil, black gold. But he gets more than he bargained for when he takes over the small Californian town of Little Boston and finds himself up against the young, ardent, local hellfire preacher, Eli Sunday (Paul Dano). And, well, that's kinda it. Because although events unfold rapidly, shockingly and utterly engrossingly, there isn't exactly what you'd call a linear, narrative plot to There Will Be Blood. Instead the film is shaped around and driven by the sheer intense, dominating force of Plainview's character. A fiercely, ruthlessly self-determining man, he remakes the world around him to suit his desires – desires not for wealth or luxury, but to be the best, to succeed where others have failed, to get one over his competitors and have everyone bend to his indomitable will. It's been five years since Daniel Day-Lewis last blistered our screens in the otherwise disappointing Gangs of New York, but now he's back to present us with another master class in Acting. With his mellifluous voice smooth as roasted chocolate, he oozes old school Greatness, in the style of Laurence Olivier or Richard Harris. Every word he utters, every facial tic, is studied and perfect; he's acting with every fibre of his being, ageing over thirty years without a single prosthetic wrinkle, just a touch of grey at the temples and the physical power of his acting skills. But Day-Lewis's isn't the only fine performance in the film. Perhaps the real revelation is Little Miss Sunshine's Paul Dano as Plainview's would-be nemesis Eli Sunday. Far from allowing himself to be wiped from the screen, he holds his ground in the face of Day-Lewis's powerhouse performance as admirably as Sunday himself stands up to the tyrannical, unpredictable oil man. Matching Day-Lewis in intensity and overwrought fervour, he's clearly learnt some tricks from the master. Watch this young actor – he could go far. 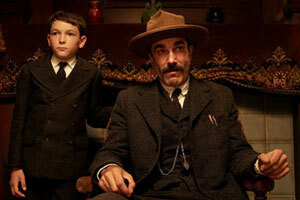 Gripping, intense and really quite traumatic, There Will Be Blood doesn't make for a cheery night out at the pictures. Accompanied by an incredible soundtrack that mingles tribal rhythms with a strident cacophony of discordant strings that aurally mirror the nerve-shredding unravelling of Plainview's mind, this is a film that will keep you on the edge of your seat with dreadful anticipation. Combining the epic, American sweep of The Godfather with the up close and messy biography of The Aviator and the dry, godforsaken loneliness and sense of pervasive evil of No Country For Old Men, this is a masterpiece of a movie. As the title promises, there will be blood. And sweat and tears and pain and death and anger. But most of all, there will be Acting.